Glenn Palmer enlisted in the U.S. Air Force Reserve on March 23, 1976, and went on active duty beginning September 10, 1976. He completed basic training at Lackland AFB, Texas, in October 1976, and then attended Air Traffic Control School at Keesler AFB, Mississippi, from October 1976 to March 1977, before serving as a Combat Controller at Pope AFB, North Carolina, from April 1977 to June 1979. Sgt Palmer's next assignment was as a Combat Controller at Rhein-Main AB, West Germany, from July 1979 to August 1981, followed by service as Non-Commissioned Officer-in-Charge (NCOIC) of Combat Control Team Element Two at Hurlburt Field, Florida, from August 1981 to December 1984. He served as Superintendent, Combat Control Detachment 1 of the 1723rd Combat Control Squadron at Rhein-Main AB from December 1984 to December 1988, and then as Superintendent, Combat Control Requirements and Acquisitions with the Chief of Standardization and Training at Headquarters Air Mobility Command at Scott AFB, Illinois, from December 1988 to November 1992. While in this assignment, Sgt Palmer completed his Bachelor of Science degree at Southern Illinois University in Carbondale, Illinois, and then attended Officer Training School at Lackland AFB from November 1992 to March 1993. Lt Palmer next served as Operations Officer with the 437th Combat Control Squadron at Charleston AFB, South Carolina, from July 1993 to May 1996, followed by service as Chief, Special Tactics Operations, Special Operations Command South at Corozal East, Panama, from May 1996 to March 1999. Capt Palmer served as Inspector General with the Chief, Special Tactics Inspections at Headquarters Air Force Special Operations Command at Hurlburt Field from March 1999 to July 2000, and then as an Air Force Intern with Headquarters U.S. Air Force at the Pentagon from July 2000 to June 2002. His next assignment was as Chief of Special Operations Strategy Issues in the Directorate of Strategic Planning with the Deputy Chief of Staff for Plans and Programs at Headquarters U.S. Air Force from July 2002 to July 2003, followed by service as Executive Officer, Directorate of Strategic Planning with the Deputy Chief of Staff for Plans and Programs from August 2003 to June 2004. Maj Palmer attended Marine Corps Command and Staff College at Quantico, Virginia, from July 2004 to June 2005, and then attended the School of Advanced Air and Space Studies at Maxwell AFB, Alabama, from July 2005 to June 2006. 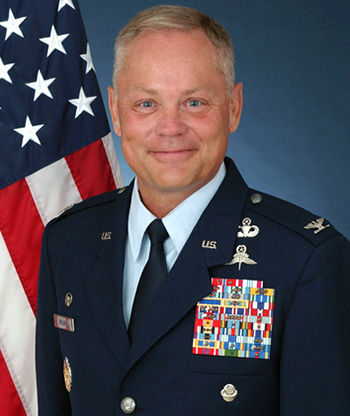 His next assignment was as Commander of the 823rd Security Forces Squadron at Moody AFB, Georgia, from June 2006 to June 2008, followed by service as a Strategist with the Strategic Studies Group, Checkmate, with Headquarters U.S. Air Force in the Pentagon from June to July 2008, and as Senior Executive Officer for the Vice Chief of Staff of the Air Force from July to August 2008. LtCol Palmer next served as Deputy Division Chief, Concept Development and Experimentation (Skunk Works) with the Directorate of Operations and Plans at Headquarters U.S. Air Force from August 2008 to August 2010, followed by service as Deputy Commander of the 720th Special Tactics Group at Hurlburt Field from August 2010 to July 2011. He served as Commander of the 737th Training Group at Lackland AFB, where he served as Commander of Air Force Basic Military Training, from July 2011 to August 2012. Staff Sergeant Glenn E. Palmer distinguished himself by meritorious achievement as a Special Operations Combat Controller while engaged in ground operations against an opposing armed force at Port Salinas Airport, Grenada from 25 October 1983 to 26 October 1983. Sergeant Palmer was among the initial airland assault combat forces to arrive on Grenada. While under small arms and continuous sniper fire, he was responsible for establishing navigational aids, marshaling arriving aircraft and coordinating air support for the Ground Force Commander. He was also responsible for providing vital forward air guide services which successfully eliminated several direct enemy threats to the airfield. Additionally, he assisted in the critical and orderly evacuation of United States citizens. He put forth the maximum professional effort while exposed to hostile firepower. The exemplary leadership, personal endeavor, and devotion to duty displayed by Sergeant Palmer in this responsible position reflect great credit upon himself and the United States Air Force.